Meet bestselling author Robert Buettner, a man who’s not afraid to do his research firsthand — even when it involves a real-life main battle tank! In this segment on You Can Write A Novel, Buettner talks about how ebooks have changed the publishing business, how it feels to read your own reviews and the secret to beating writer’s block. 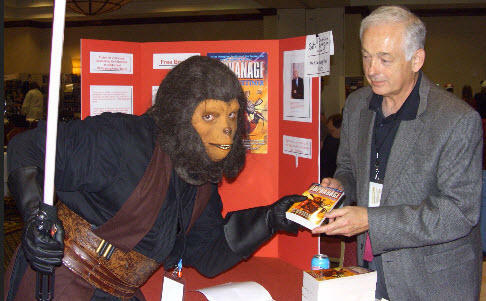 Plus, as you can see, no book signing is complete without a visit from a ninja ape-man. Naturally. Laurence MacNaughton: By my count, Overkill is your sixth novel. How is your career (and/or the publishing business) different now than when you started? Does the writing get any easier, or do you face a new set of challenges now? Robert Buettner: The book biz, like the world in which it operates, has been changing at an ever-accelerating rate. Based on my royalty statements, in the last year “mobile device” proliferation has finally caused e-book unit sales to take off like a firewalled F-16. Book promotion now appears to be a matter of accumulating Facebook friends, but I remain a social media Luddite. A writing day bares my creative cupboard. I lack the wit surplus to fire off a dozen clever tweets to my followers. I still visit brick-and-mortar stores and autograph their stock. Maybe that’s the authorial equivalent of the last tyrannosaur chasing the last triceratops. Mechanically, writing’s easier. My word processor manages a lot more proofing and backtracking even compared to what it could even a few years ago, when I started. I research via Google rather than organizing a library safari. I can’t imagine how the great novels were composed longhand, or on a typewriter. I still proof a physical print copy of my manuscripts before I turn them in, but I turn them in electronically now, which is faster, cheaper, and environmentally friendlier. LM: Do you ever read your own reviews? RB: Every word. It’s probably easier for me than for some authors because my reviews have, so far, fingers crossed, been overwhelmingly positive. The decline of newspaper and similar print review sources has removed a useful filter from opinion, and that’s a little scary. Today any anonymous source who hasn’t even read the book can say absolutely anything about the book, and that “review” may pop up on Google ahead of more thoughtful commentaries. But so far I’ve rarely been victimized that way. LM: If you had to pick just one personal quality that separates the would-be writers from the published professionals, what would it be? LM: Do you ever suffer from writer’s block? And if so, how do you beat it? RB: Barbara Hambly and I were guesting at an SF Con a couple of years ago. Barbara answered that question as well as I’ve heard it answered. Barbara said real “writer’s block” is an exceedingly rare clinical phenomenon. What most writers call “block” is just a subconscious warning we give ourselves that, “hey, this chapter, this paragraph, this plot line isn’t working.” So we just sit there, dithering. The fix is simple. Walk back the dog through your work until you encounter the last point where you’re confident that the story was working. Begin again from there. With luck, that point is just a page back. Maybe you lose a whole chapter. Maybe you have to go back to page one. But at least you’re unstuck. The secret to efficient “block” beating is, I suppose, recognizing it before you’ve sleepwalked ahead through too many worthless pages. It works for me. LM: Is there any truth to the rumor of an Orphanage movie? RB: Well, the most interesting recent project I’ve been connected with lately is the film adaptation of Orphanage by Olatunde Osunsanmi, the rising director and screenwriter (The Fourth Kind, forthcoming Dark Moon) for Davis Entertainment (Predator, I Robot, Eragon). Thousands of books are optioned for film, but never get to a “treatment,” much less to the director-plus-adapted-screenplay stage where Orphange is already. However, Hollywood is notably longer on dreams than on reality, so Orphanage the Movie remains light years away. Therefore, I hadn’t mentioned it much. But the news popped out in the Hollywood press last October. It’s totally Tunde’s screenplay. My input has been minimal, and that’s a gross overstatement. But I was flattered that he chose to lift more of the writing direct from the book than is usual in an adapted screenplay. LM: We’ll have to keep our eyes peeled for that! What else are you working on? RB: Amazon’s Audible.com is releasing the new series as audio books. 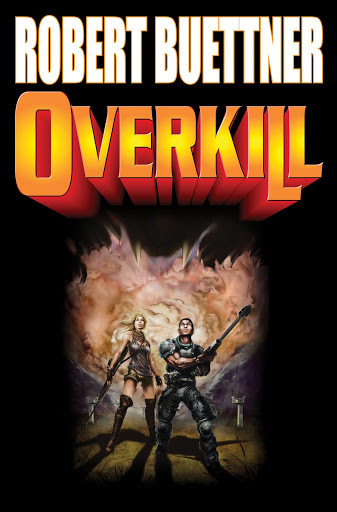 Overkill’s already available. I’m looking forward to working again with the reader who Audible chooses for Undercurrents. MacLeod Andrews, the young (everybody’s young to me) actor who read Overkill was terrific. I’m finishing an original short story for the forthcoming John Joseph Adams anthology “Armored.” That story will be loosely set within the Orphanage-Overkill universe. At the moment, I’m judging the short story finalists in the National Space Society’s Jim Baen Memorial Writing contest. I’m filling in for the venerable David Weber, and following in the footsteps of such notable authors as Mike Resnick and Eric Flint, so that’s pretty cool. 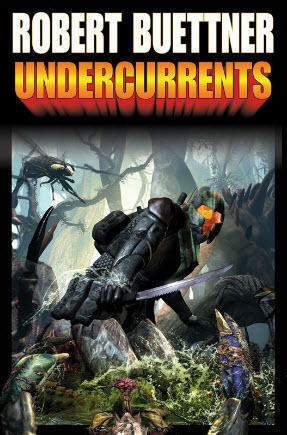 Beyond that, of course, Undercurrents, the sequel to Overkill, is set for release July 5, 2011, and there will be a third book in that series. Bestselling author and all-around nice guy Robert Buettner is back on You Can Write A Novel to give us a glimpse of what it’s like to be the author of a “big” book — and he tells us how he tackled writing something entirely new on the heels of the critically acclaimed Jason Wander series. Plus, he shares his five tips for becoming a bestselling author. I think the confusion may be worse because e-book readers skip some clues that physical book readers see. The physical books of the Jason Wander series now in stores have the book number, 1 through 5, on the spine, and the five books are listed in order inside, opposite the title page, under the heading “Books by Robert Buettner” The new series has a similar list opposite its title pages. But, as is customary in publishing, each publisher only lists the author’s books that IT publishes. Thus, “Baen Books by Robert Buettner” lists only the new series. LM: What’s it like writing an entirely new book, after the critically acclaimed success of the Jason Wander series? Was it hard to switch gears? RB: Liberating, actually. The Jason Wander books were written 100% in Jason’s first person voice. The new series allowed me to see and comment on the world from new viewpoints. One viewpoint is very new. In fact, I hope, readers will find it not just new but unique. In the same way, a new publisher, and so new editing and supporting perspectives, were also liberating. Time Warner Aspect, which became Little Brown Orbit, publishes the Jason Wander books, and does it marvelously. Orbit’s also very much a New York Big Six imprint, and as such formal in author relations, compared to an independent. Baen, which is publishing the new series, is very much an independent. But a unique one. Baen began as, and kind of remains, the defacto science fiction imprint of Simon & Schuster. Baen’s SF/F list is as large as a New York Big Six imprint’s list, and S&S distributes Baen books with all the clout of the New York Big Six publisher that S&S is. But Baen isn’t physically located in New York. Toni Weisskopf, Baen’s publisher, continues the late Jim Baen’s enthusiasm and hands on involvement with Baen’s authors, as well with Baen’s readers. Baen’s process is less formal than a New York Big Six imprint, but the quality, expertise, and resources are very equivalent. Another change accompanied the shift to Baen. 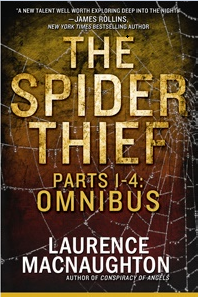 Baen/Simon & Schuster chose to give the new series “Big Book Treatment,” meaning the format is larger even than trade paperback, with author name prominent. The theory is that I now have a following who will buy the book not because of the covers (which are bold and striking) or the store placement (which is prominent), or even the reviews, but because (gulp) I wrote it. That’s flattering, but also high-wire scary. LM: So, no pressure or anything. How about sharing a common question from aspiring writers? 1. Write. Don’t just think about writing and read books about writing, though by all means do those things. Do it. Until you take that step you won’t know whether you want it bad enough. And if you really expect to learn the craft well enough to be New York published, you had better want it pretty bad. 2. Write lots. They say that a writer has to write a million words to develop the skills to produce salable commercial fiction. I believe Stephen King had collected seven hundred short story rejection slips before he sold his first one. I completed seven novels of varying degrees of awfulness, now boxed up for eternity, before Orphanage. 3. Write well. Study The Elements of Style by Strunk and White, and anything Mark Twain wrote about writing. The best contemporary treatment of the art and craft of writing that I’ve seen is King’s On Writing. Find a mutual critique group of people who know what they are talking about, take your lumps, and learn from their mistakes and yours. If you write well, you will be ahead of ninety percent of the twenty-five thousand or more unsolicited slush submittals that a reputable agent wades through annually. 4. Rewrite well. There is no good writing. There is only good rewriting. 5. Last but not least, persevere. When you have written, then rewritten, a novel so good that it can’t be ignored, be prepared to reinvent yourself and your craft when it is ignored, anyway.